We are so excited to announce that any teen girl between the ages of 13 and 17, in need of financial assistance to attend our summer camp, can now apply for a scholarship. In the past, we’ve limited our program to only teens that live on Maui, but now, with a generous donation from the Will Smith Foundation, we are expanding our program. The deadline to apply for a scholarship is June 1, and the camps run July 15-21 and July 22-28. Click here to view the application. Each Week starts off with an opening circle ceremony. Now in our 19th summer, we dedicated to empowering teenage girls through Maui’s water sports, unique camp programming and strong mentorship program. Activities may include speed boat rides, wake boarding, snorkeling and waterfall hikes. Teens from all around the world attend our camp, and the scholarship program makes it possible for teens to join the program, who might not be able to attend otherwise. 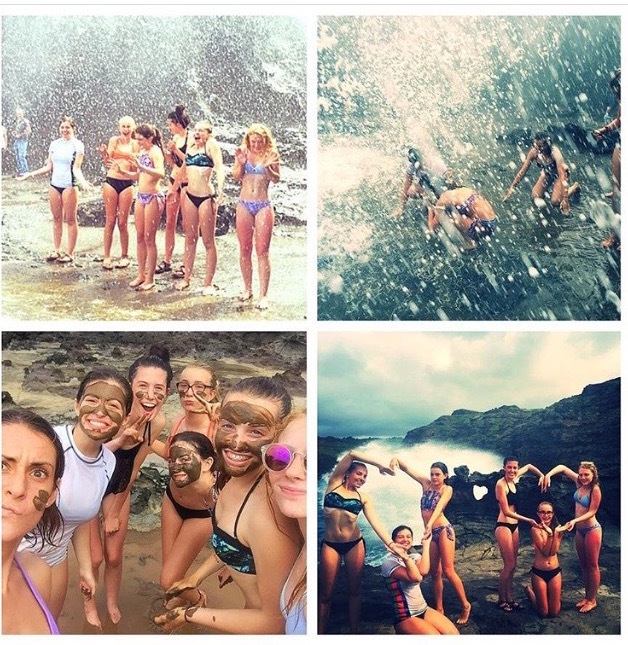 Mud Masks and Surprise Outdoor Showers! Every afternoon is a new island adventure! The teen camps are overnight camps, with on-island transportation, oceanfront accommodations, all meals and activities included. Both camps will have surf lessons each morning, with a professional, all-female surf coaching team, a service learning project, and an evening ‘counsel’ session, an MSG tradition. Pono Camp (pono is a Hawaiian word that is generally translated as morality or righteousness) will include afternoon workshops with inspirational life coaches, art therapy, nutritional counseling and a Hawaiian cultural hike. Mana Camp (mana can be translated as power, typically in the spiritual sense) will include more advanced surf coaching options, junior lifeguard training, personal training sessions, and Surf Olympics, another camp tradition. 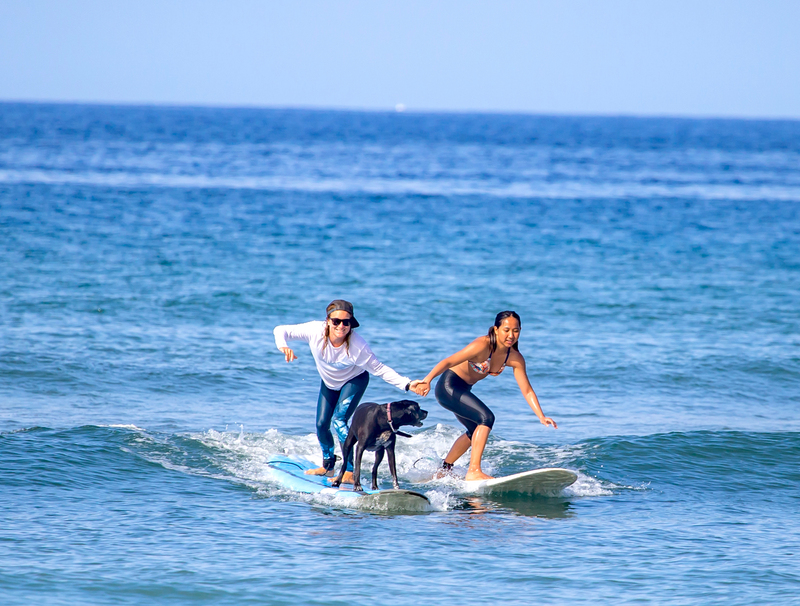 Camp Founder Dustin, and her surf pup Luna, surf with one of last summer’s campers. Each teen camp is 7 nights and 8 days and costs $2,375 plus tax and registration. To attend both camps, the fee is $4,650. There is a 10% discount for Hawaii residents. Teens requiring financial assistance to attend are invited to apply for scholarships at this link, with the deadline of June 1 : https://www.mauisurfergirls.com/community-outreach/. Donations to the GoFundMe page, which go to the camp’s scholarship program, may be made on the same page. To learn more about our Teen Camps, click here. 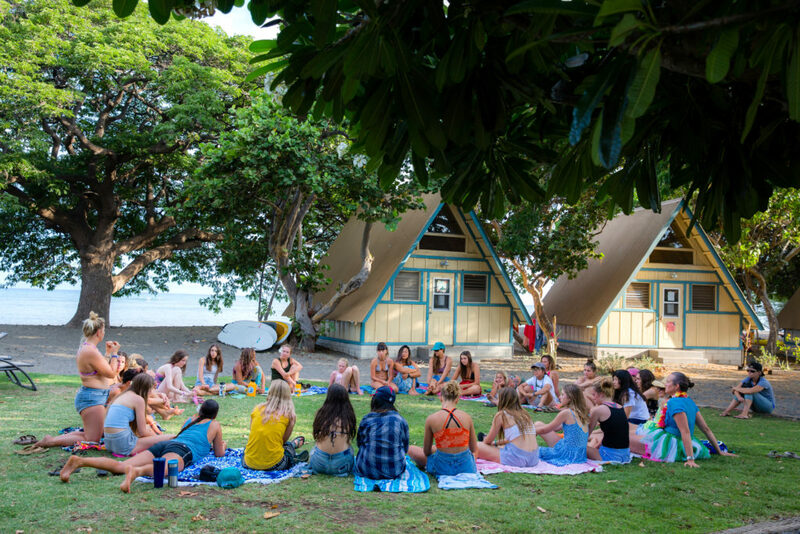 In addition to the teen’s camp, Maui Surfer Girls’ offers a women’s camp for ages 18 and up. The camp is run as wellness retreat, with a blend of physical activities and relaxation programs. The company’s focus on women’s empowerment sets it apart from other retreat experiences. “I designed this program for teen girls almost two decades ago,” explained founder Dustin Tester, “but the need for strong females bonding together is now greater than ever. The response to this program has been fantastic, with almost all of our camps selling out this past year. Whether it’s facing your fears of the ocean, taking your sport to the next level, or just taking a week to reconnect with yourself, there’s something for everyone at this camp,” she continued. Surf camps are open to beginner and intermediate surfers, with the all-female professional surf coaching team helping campers progress their skills each day. Besides surfing, possible activities include whale watching, snorkeling, hiking, yoga and massage. Oceanfront accommodations, professional surf coaching, a quiver of surfboards, three healthy meals a day, on-island transportation including airport transfers and various activities are all included for $1,950 plus tax per camper. Kama’aina receive a 10% discount. Women’s camps are currently sold out until October 2019, with 2020 dates to be released in the spring of 2019. Maui Surfer Girls was established in 2001 with a mission to build self-confidence in women through the sport of surfing. 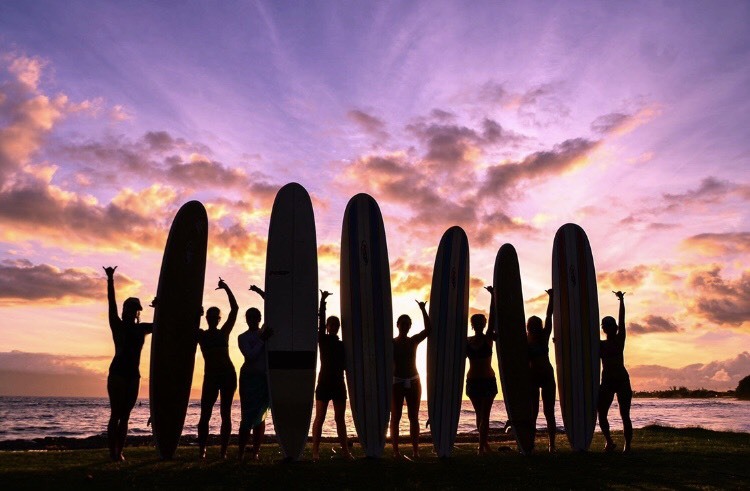 Maui Surfer Girls builds life-long bonds through a community of strong female role models and has been recognized nationally for their signature surf camps and co-ed surf lessons. Raised on Maui, Dustin’s dad taught her how to surf when she was seven. She’s been a multi-sport water athlete ever since. She received her bachelor’s degree from Prescott College’s Wilderness Therapy Program. In the desert canyons of the San Juan River, Dustin got her inspiration for Maui Surfer Girls during her thesis project on creating a rite of passage for teenage girls. Dustin’s work with the Voyager Outward Bound School also fueled her passion for personal development through outdoor education. She’s taught hundreds of students about the stoke of surfing, and living aloha. Always adding to her bucket list, Dustin has skydived, tow surfed Jaws, written a book, surfed in Africa with elephants, taught Cher how to surf, and recently completed an Ironman in 2012 in Panama City, Florida. In her free time she enjoys skateboarding & surfing with her dog Luna. William Naylor Smith was born March 19, 1999 into a ranching family in South Texas. Before he could walk, he was on a horse. By the age two, he was in Africa accompanying his parents on safari. Will opened up his heart to the world by sharing anything and everything he could with friends, family, neighbors and strangers. Will was a “giver” from the start. Whether it was a smile, a laugh, stories of his adventures or giving his possessions to other kids, Will wanted to share his passion for life with the rest of the world. The only thing Will didn’t like was to be left out of anything. He wanted to do it all. Whether it was snow skiing, bowling, basketball, baseball, football, mountain-climbing, tree-climbing, snowboarding, hunting or fishing, Will wanted to be a part of it, and he would try and try until he got it right. But perhaps Will’s favorite thing to do was share with others. That is one thing he did not have to try to get right. Will looked at life much like a grown-up, showing compassion and generosity that was so unique in a child his age. All of these things ended for Will on June 3, 2007 when he lost his life in a tragic car accident in Hawaii. The world was only fortunate enough to have Will Smith for eight short years. He was a very special person. It was not until his death did anyone realize how many people this small child had reached and affected. Will’s generosity and love of life has inspired the creation of The Will Smith Foundation to continue his benevolence. Even though Will is not physically with us any more, his kind and giving spirit will continue to fill the hearts and enrich the lives of many.